We met on W. 10th and Hudson Street in New York City. Hungry, but not that hungry. I knew she was my kinda woman when we sat down at The Cowgirl and she ordered two Bloody Marys. When I decided to meet with Heather, I wasn’t sure what to expect. To be honest, up until that morning, I didn’t know who she was - I don’t watch TV. But I am here to tell you about the woman behind ‘Dirty Freedom’ (#DirtyFreedom) and why she organized an amazing journey to Kilimanjaro with 18 courageous, strong, and perseverant women. Heather Thomson is best known for her role on Bravo TV’s Real Housewives of New York City and her job as a celebrity fashion designer for celebrities like Sean ‘Diddy’ Combs, Jennifer Lopez, and Beyonce Knowles. Not only that, she is also the founder of the successful Yummie by Heather Thomson fashion brand. Most importantly, she is the supermom of two beautiful children, Ella (9-years-old) and Jax (11-years-old). Like I said, she’s my kinda of woman! After two and half hours of getting to know Heather over tears, laughs, and drinks, I would say her two most impressive accomplishments (to me) are: being an amazing mother and spending the last 13+ years being a massive advocate for organ donation. Heather passion for organ donation stems from her personal experiences with her son, Jax. She sits on the board as a ‘founding’ member of the The Kellner Family Pediatric Liver Disease Foundation and works to educate the public on organ donation at both the local and national levels. Heather is also an ambassador for a charity called, No Barriers. No Barriers is an organization that empowers people to break through barriers and find their inner purpose. This organization was the inspiration behind the climb. As I mentioned earlier, I didn’t know what to expect when I sat down early that morning with Heather. All I knew was that she organized this amazing climb to Kilimanjaro, but I did not know the real catalyst behind it. I also wanted to know why she, alongside the women she climbed up Kili with, kept using the term “Dirty Freedom” when referring to the adventure. After hearing about her life and this ridiculously inspiring journey up a mountain, I knew this was a story the world had to hear. Heather is a go-getter and lives a fairly active lifestyle. 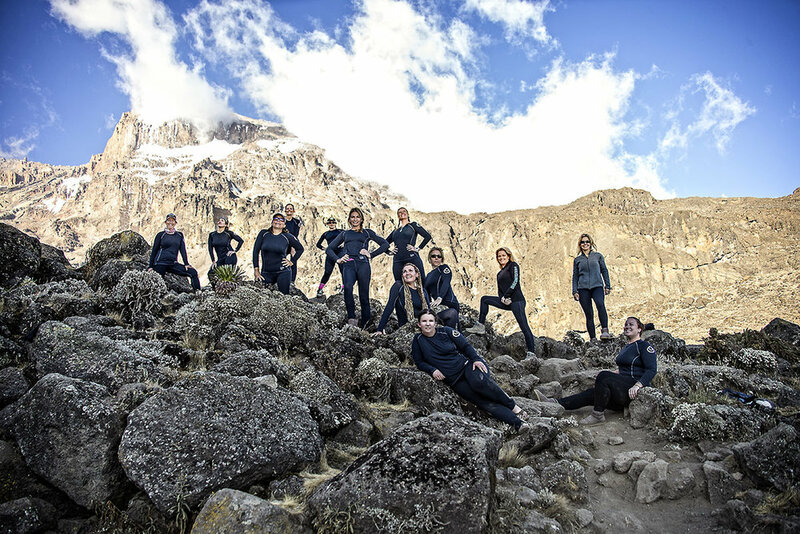 She had never really climbed anything as challenging as Kilimanjaro, but she had always wanted to, so she decided to organize a group of women who would be down for the adventure. On September 17th, Heather and 18 other women headed to Africa to climb one of the ‘Seven Summits,’ Kilimanjaro. These women had no idea what to expect. All coming from different walks of life. Different challenges and experiences. Some of these women were Veterans, Brain Cancer Survivors, and TV personalities. The only thing they had in common, besides the fact that they were women, was their determination to climb to the summit of Kilimanjaro. When you hear stories like this from people who live a pretty average life, the first thing that comes to mind is ‘why?’ I mean you can go to the gym every day and be physically fit and healthy, but why plan to climb a major summit? What was the point of all this? I asked Heather and her response was perfectly expressed.. I felt like I could relate. It’s so simple yet one of the most difficult things we struggle with daily as humans. Disconnecting. She said that her life is always moving. She had never done anything like this and it wasn’t so much the accomplishment that made her proud, but the journey. They were looking for “Dirty Freedom,” which Heather describes as an experience that was raw, fresh… dirty. It was a clean freedom yet ‘Dirty Freedom’ that allowed them to summit Kilimanjaro. We are so used to the routine. Especially as women, I feel as though most of the time we don’t give ourselves enough credit. We do a lot. We hold a lot in and work hard. We are always striving to prove something. Sometimes we need something different. Something that challenges us and awakens the soul. We want freedom. The training was extensive, not only for her, but for these women too. Some started training a year in advance to prepare for this climb. The physical aspect of the climb, wasn’t even the hardest part. The hardest part was learning to climb together as a group and supporting each other along the way. Heather wasn’t alone; each of these 18 women had a struggle with this too. Even though they were there together, it was a freedom, a “dirty freedom,” they had never experienced before. Take Yvonne Heib for example, a Retired Military Veteran. She was an Army Nurse for 18 years. She was wounded in 2010 in Afghanistan by a mortar that landed 6 ft away from her. She was diagnosed with TBI and PTS (Traumatic Brain Injury and Post Traumatic Stress). She has a short term memory problem. This climb was a real accomplishment on personal and physical level. She did it. Stevie Galanis, spent 8 years in the National Guard, was medically discharged in 2010. She was suffering from a back injury and from the trauma of being sexually assaulted by a squad member. For Stevie, this was the catalyst for the climb. She wanted to prove to herself that she was strong enough physically and mentally to do this. She did it. Another “average” women, who like most, wanted to do something different, something rewarding, Patricia Perez. She is turning 50 in March and wanted to do something amazing before her 50th. With the encouragement of her husband, she decided to join Heather’s climb to Kili. So she did. These women all had something they wanted to prove to themselves. They wanted to step out of their norm. They wanted freedom. Referring to freedom as if it were perfectly imperfect. Just because life has taken an unexpected turn or become a little harder these women had one thing in common. They never gave up. Learning to face challenges everyday, just like climbing Kilimanjaro, was a no brainer. They came together and finished this challenge together. I believe that was the biggest message. Never giving up when times gets hard and working together for a common goal despite differences in life experiences. This touched home for me. In those 7 days it took them to reach the summit of Kilimanjaro, they learned to take in the present and get rid of the noise in their lives. It was an exercise in mindfulness. They didn’t love their family and friends any less, they just learned to give themselves a break and credit when they deserved it. They learned to let things ‘just be’. These women were spirited, passionate, and free. They learned what it felt to be free.